Sticky notes are not just great for writing down short memos and to-dos but also a great way to book mark and organize things too. We use good quality papers. we can do any printing as per as requirment. Usage : Noting reminders for self or others. Quick reminders for fast action. Brief instructions and get the job done. With the support of expert team and affluent industry experience, we offer an exclusive assortment of Sticky Branding Note Pad. 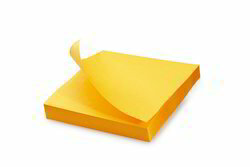 Size: 4" x 4 "
We manufacture sticky notes with customer preferred shapes, with printing. No: of sheets are limited to 25 nos per pad. Our Sticky-Notes yet another product from our range symbolizing quality with affordability.The different sizes which they are available in, makes the Sticky Notes a handy tool for book marks or lists or messages which can be stuck anywhere you desire.The adhesion capacity of these notes matches the best global standards. We are offering a wide range of Silicone Rollers Sticky Pads to our clients. 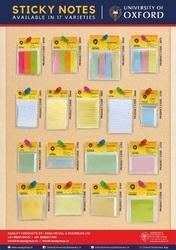 sticky notes to serve as a great help remembering things. It is a great corporate gift too! !